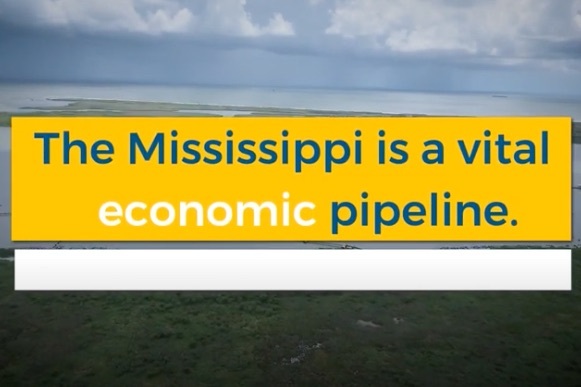 “The Big River Coalition is committed to ensuring the future of navigation on the Mississippi River Ship Channel (MRSC) as one of the nation’s fundamental natural resources and true economic powerhouse. The Mississippi River and Tributaries has an estimated annual impact of $735 billion on the nation’s economy and is responsible for 2.4 million jobs (585,000 jobs on the Lower River – Cairo, IL to the Gulf of Mexico and 1.86 million plus jobs on the Upper River-Lake Itasca, MN to Cairo, IL when including the IL River).“ — Sean Duffy, Executive Director, Big River Coalition. This video documents the beneficial use of dredged material or “sediment recycling” as the term the BRC uses to describe this program. The sediment recycling began in 2009 when cutterhead dredges were reintroduce to the channel maintenance toolbox, the beneficially used material removed from Southwest Pass has restored approximately 5,000 acres of new Louisiana. The sediment recycling practice also extends to removing deposited sediments for the Hopper Dredge Disposal Area (Head of Passes) and beneficially using them, the total acreage created from the HDDA is almost 3,000 acres. The sediment recycling efforts have created almost 8,000 acres of marsh in less than 10 years in an area that experiences the highest land loss rates in the world. The best economic estimates available indicate that the MRT has over a $735 billion annual impact on the economy of the United States, the acreage created helps to protect this critical artery of international trade. Association of Ship Brokers & Agents (USA), Inc.
Committee of 100 for Economic Development Inc.
E.N. Bisso & Son, Inc.
Exxon Mobil Refining & Supply Co.
Inland Rivers Ports and Terminals, Inc.
John W. Stone Oil, Inc.
Louisiana Farm Bureau Federation, Inc.
MSC Mediterranean Shipping Company (USA) Inc.